I must admit its all these theme based cooking that is motivating me to either prepare bookmarked recipes or try out new recipes. I’ve come across so many mug cakes but never really bothered to try them out. For the No Bake Desserts theme, we are suppose to make a dessert which we would normally bake in a convectional oven but not bake it in an oven…confused?? Basically no using a convectional oven. 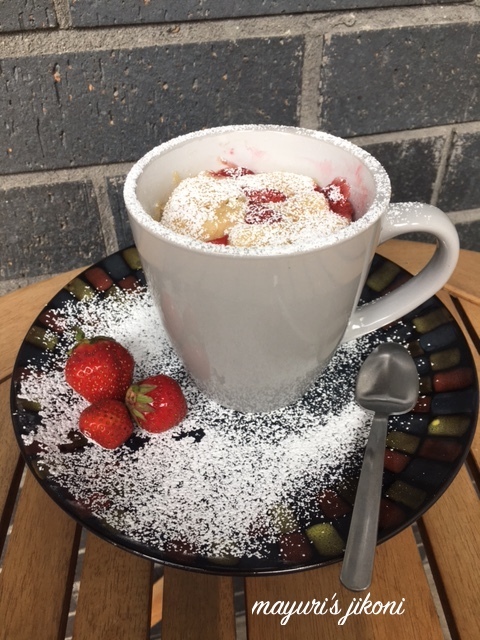 Taking advantage of the abundance of berries available in the markets in Montreal, I decided to make a mug cake in the microwave oven instead of using the convectional oven. 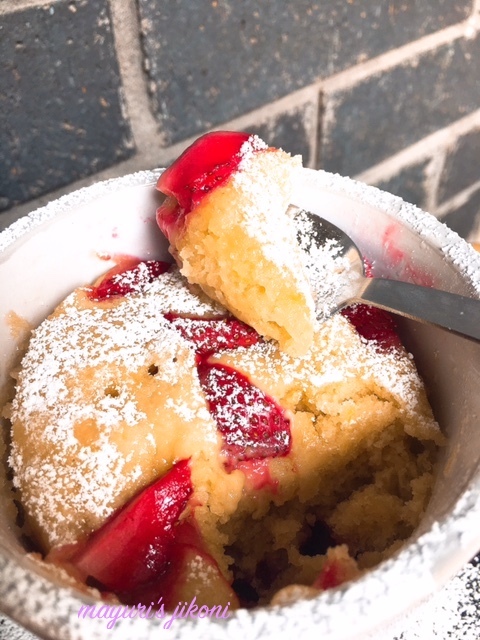 I must admit I still love my ‘properly’ baked cakes but as a quick dessert treat… and I mean really quick, mug cakes are not a bad option at all. Even my sone was surprised that I could bake a cake so quickly. Last week when we went to the supermarket, I was looking for brownies to prepare my other no bake dessert and I didn’t find any(perhaps Montreal people do not like brownies???). His answer was bake it the microwave! The first mug cake I tried was when my daughter was visiting us in Mombasa and she made a chocolate mug cake. It was super heavy…not weight wise but heavy for the tummy. I don’t have a microwave oven at home (hubby doesn’t like any food zapped with laser beams or whatever rays are present in the micro). However, we have one at our holiday apartment by the beach. Nami, packed all the ingredients in a little tin and she baked it at the apartment. It was really delicious and it turned out good and not all mushy and gooey. Here in Montreal, my son has a microwave oven so I was dying to try out the mug cake. To make it a bit lighter than the chocolate cake Nami had baked I added fresh strawberries. I must say the cake was really delicious, but this too we shared as it was just too much for one person. 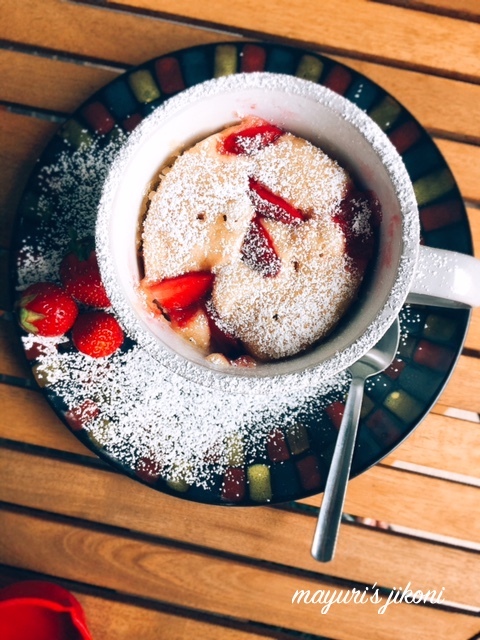 So here’s my Strawberry Mug Cake and yes I would definitely make it again. I know most people mix everything in the mug itself and bake. However, I prefer to mix the ingredients and then scoop out the batter into the mug. I greased the mug lightly so that the baked cake did not stick to the wall of the mug. This is a vegan recipe. I used the big yellow lemon which adds such a citrusy wonderful taste to the cake. Lightly grease a big microwavable mug with oil. Add all the ingredients into a small mixing bowl. Mix it with a whip or a fork. Add the chopped strawberry pieces. Pour the batter into the mug. It will fill half of the mug. Microwave for 80-90 seconds (1½minutes). Insert a toothpick in the middle of the cake. It should come out clean. If the cake is not done then microwave it further for 20-30 seconds. Make sure you lightly grease the mug with oil or butter. You may use normal milk or almond, coconut, soy or any nut milk. I used light brown sugar, however you can use normal white sugar if you prefer. You can use frozen strawberries. The sweetness of the cake was just right for us. However, if you prefer a more sweet cake, add 1 more tablespoon of sugar. Ah even my hubby doesnt like a MW..but have managed to coax and buy one…the MW version of mug cakes is super and yours looks tempting. Love the clicks. These sort of mug cakes are a real boon to satisfy those sudden cravings. Love the use of strawberries here. Mug cake are always best for those sudden baked dessert cravings. This looks so tempting. I use my microwave extensively and this recipe I am bookmarking. Looks very delicious!! Thanks Amrita, I too was surprised how good it turned out in such a short time. Yes Padmajha, these mug cakes are a boon and I made some again but just to satisfy the craving. I usually share it with my hubby. Srivalli, I don't miss the microwave, but am sure will when I get back home. In the meantime enjoying these mug cakes. thanks Sapana, after baking one I realised how easy mug cakes are. Thanks Veena, let me know if you liked it. oh love it, first click is very inviting, chunks of strawberries peeping from the cake is very tempting! Mug cakes are boon for sudden cravings, or a single serve, bookmarking this to try sometimes!